Turns minerals into fertilizer, unblocks, protects and enhances irrigation. Salinity, scale and iron removal for a healthy garden. health of ovals, parks and gardens. Softens water, protects equipment and reduces maintenance costs. and develop cleaner irrigation systems. Hydrosmart physical water conditioning system is a simple, sustainable and effective approach to conditioning water. By applying Hydrosmart’s unique resonance frequencies you get the advantages of using a technology which requires no chemicals, no filters and no maintenance. Thousands of satisfied customers around Australia and worldwide are benefiting from this proven technology. We research, develop and manufacture our original 100% Australian products to deal with high minerlised and hard water quality problems. Our products provide water conditioning solutions for bore water, river water, town mains water, saline water and water rich in minerals such as salinity and iron. 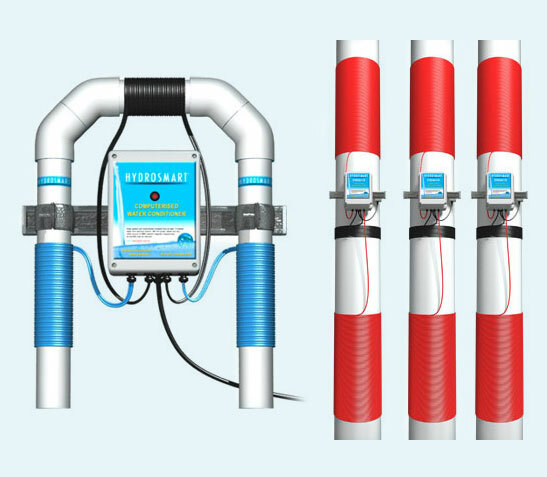 Learn how Hydrosmart’s enviro friendly hard water conditioning technology works with no filters. View our large range of solutions for your domestic, commercial and industrial hard water conditioners. We have thousands of customers in Australia. See the great results they achieve using Hydrosmart. Call us today and speak to an expert consultant for advice on your hard water conditioning problems.